Last week brought lots of cold weather all over the States. Subzero temps for many and freezing temps in states where it's rarely that cold. I fought the cold weather by making several soups and staying indoors when I could. I made a great Creamy Chicken Soup (find the shared recipe link on my Facebook page), and still had tons of leftover chicken and broth, so I came up with this soup. 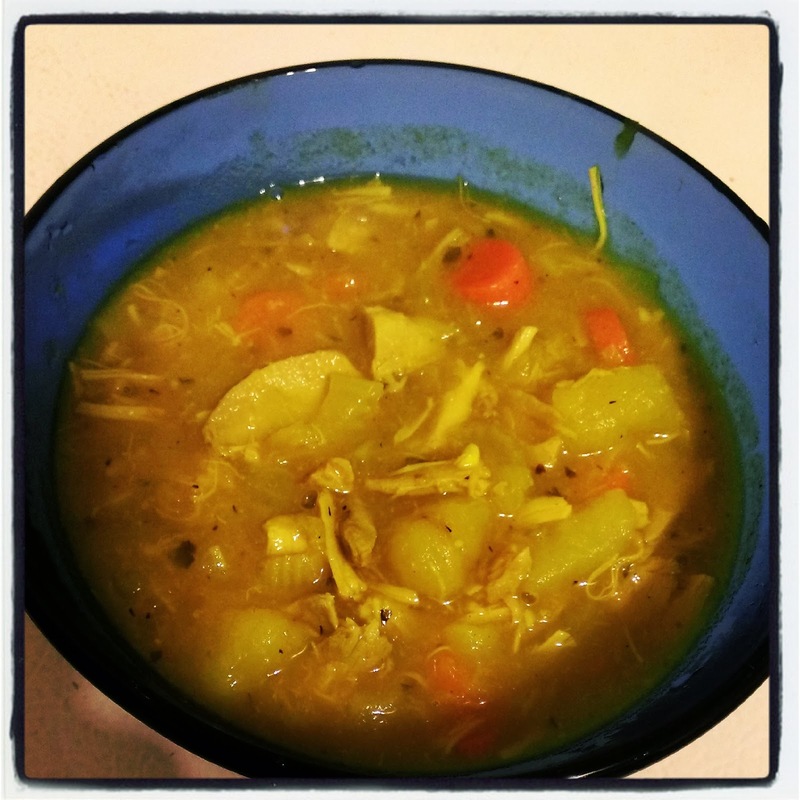 A nice hearty soup with anti-inflammatory properties from the turmeric. The white sweet potatoes will make a difference in the texture and color, so be prepared for it to be a little sweeter and softer if you substitute regular orange sweet potatoes. 2 tbsp coconut oil or F.O.C. In a large pot or dutch oven, melt the fat over medium low heat. Add in onions, leeks, and celery. Cook until starting to soften. Add carrots, garlic and seasonings until aromatic, about 30 seconds. Add in 4 cups chicken broth, sea salt and pepper, parsley, and sweet potatoes. Bring to a boil and then reduce heat to a simmer. Simmer until all veggies are soft. Add in apple cider vinegar and chicken and stir thoroughly. Cook until heated through. *Turmeric is a pretty potent spice and it can have a kick. If you aren't sure about how much turmeric you can handle, start with 1-2 tsp and then slowly add in the remaining turmeric at the end 1 tsp at a time, stirring thoroughly after each tsp and taste testing as you go. **If you adjust the turmeric, you may need to adjust the ACV. You can also feel free to add more at the end to help balance out the kick from the turmeric if you find it to be too much.